? Restore the trust, love, and passion that have been lost over the years! Yeah, sure, but is this really possible? Most of the couple breaks are perfectly foreseeable, it is not necessary that you get to divorce if there is still something to rescue and this is a reality, you can get your sacred relationship to last forever ?. Is there something to rescue in your relationship? Let me tell you a secret, just by looking for this book you can tell that you are willing to fight for the person you love! And even though time and mistakes probably made a dent in your relationship, this guide can help you step forward a bright future together. Find out how bad things actually are. You may be surprised, but most couples think about breaking up when they are still dealing with small issues. At the beginning of this book, you will find all the information that you need to know if your relationship is really in bad shape. Get to recognize what you both did wrong. Before healing your marriage, you need to know which path you followed that led you to the breakpoint where you are now. Find forgiveness and recover respect, become your partner's accomplice now and ever. Don’t fall in the same mistakes ever again, build together a new relationship with feelings that will last forever. Even when how to save your marriage is based in the most sophisticated relationship knowledge from the hands of an expert, the method is broken in three major steps that will be easy to follow and understand for anyone in need of this information. 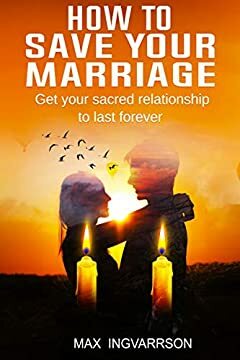 In the end, this book will give you the tools and step-by-step advice that you need to overcome your current situation and make with your partner a happy ever after story. So, wait no more and click the BUY NOW BUTTON at the top of this page. © 2019 All Rights Reserved !